Would you like to join Stampin’ Up! 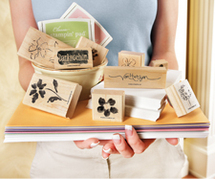 Are you a crafter who likes the idea of buying Stampin' Up products for personal use AND getting a 20% discount? Are you a crafter who likes the idea of the above and maybe would like to share your love of Stampin' Up! with friends and family? Are you a crafter who likes everything above but would like to be a Demonstrator who would love to do workshops and classes to earn extra money? Are you a crafter who would like to have your own viable business with a long term career and climb the Stampin' Up! ladder? If you answered 'YES" to any or all of the above then joining as a Demonstrator is just the answer for you! Joining as a Demonstrator with Stampin’ Up! has great advantages. You can up to £130 worth of products in your kit and only pay £99 for it. The Starter Kit will allow you to start your own business, be your own boss and start earning an income from what you love to do best - CRAFT !! !